"I believe that every slug should have its day," said Santa Cruz Mayor Ryan Coonerty. The resolution would make September 27, 2011 the day of the mollusk mascot, which has represented UCSC officially for the past 25 years. The costumed Sammy the Slug character will be there "in person" for the vote. The council meeting begins at 2:30 p.m., and the resolution vote takes place early in the agenda. In 1986, the student body rose up and fended off a challenge from a rival mascot, the Sea Lion. Up to that point, the Banana Slug had been a popular underground mascot on campus. Read the full story right here. Also on Tuesday, September 27, a UCSC Banana Slug appreciation booth will be set up at Quarry Plaza just in front of the Bay Tree Bookstore on the UCSC campus, featuring an appearance by Sammy. The on-campus event takes place from 11:30 a.m. to 1 p.m.
At noon outside the bookstore, the costumed Sammy character will hand out cookies shaped and frosted to resemble banana slugs. 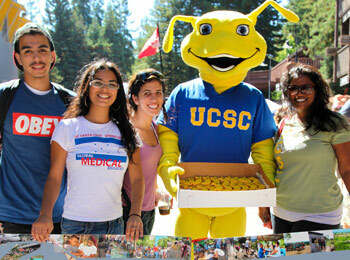 The UCSC Banana Slug is one of the most well-recognized emblems of UC Santa Cruz. It received an enormous publicity boost in 1994 when filmmaker Quentin Tarantino dressed a hit man played by John Travolta in the UCSC "Fiat Slug" T-shirt during the last minutes of the award-winning film, Pulp Fiction.